I have had a love affair with the night sky for as long as I can remember. It is only in the last five years that I have combined these two interests. This came about by the example and encouragement of a dear friend. She introduced me to the absorbing passion of astronomical sketching. This activity as given me an outrageous amount of pleasure and learning and continues to do so. I have discovered that to achieve a good sketch, you have to want it. You have to look at what you want in a way to observe it and absorb it. You must take a mental note of your target; this is the kind of thing I ask myself when I look at the moon for a sketch. 1. Where is the light coming from? 2. What kind of grey tones are on view? 3. Where are the dark areas and what shapes are they? 4. What is interesting and how will I achieve it? 5. Is there a bright area and how will I do it? 6. Where is the lunar drama tonight? My EXT 70 pencil sketch sequence from December 6th, 10th and 12th 2005 is an example of my early work. I used to sketch with my drawing pad in my left hand, with various pencils in my teeth and some in my pocket. I even bought a sleeveless jacket with lots of pockets, a photographer’s kind of jacket, which was very useful. I do not have a drive on my telescope so I move it with my head or my free hand, my knee or what ever it takes to follow my target over the time I am attempting to capture it in a sketch. One day I bought all the grey conte crayons and pastels I could find that matched the lunar greys. I had been finding it difficult to distinguish the grey tones in the dark and have taken to using a candle in a storm lamp just to choose my colours. I keep it at my feet and just hold the pastels or conte down to it to see what I am picking. Sometimes I use a headlight especially if I am doing fine details. I bought a field easel , I wondered if it would be too much hassle and not get near enough to the eyepiece. I have done most of my best work using it and found it a great addition. The easel gives me two free hands, it gets close enough and I have something to lean on. My way of going about lunar sketching is about layering and or removing pastel or conte crayon. highland areas. 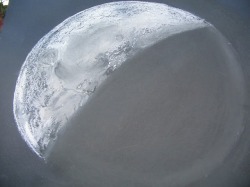 I etch out craters with a toothpick or metal needle . I dull the clean line of the moons limb to begin the effect of Earthshine. My sketching is more akin to etching, as I lay down layers and etch away areas to create the moon as I see it. If I want to bring emphasis to a brightly lit crater like Proclus or Tycho I lay down a large thick area of white pastel in that place I then overlay it with grey pastel, then I use a wooden toothpick to scrape in the rays and reveal some of the white beneath I top up the white ray with more pastel and then use a blending stick to soften the ray and then sometimes a very thin pencil line to emphasise one side of the ray and pop it out a bit I discovered by accident that a wet toothpick is great for making very black craters and lines. Some water colour pencils are very hard if not used as they are meant to be used . They also make very clean black lines over the pastel. In attempting to capture the whole Moon, it is so much more noticeable how she rolls. You do not see it so much in smaller area sketches that take less time.